Hang on to Your Hats, and Grab Your Winter Coats! A weather system is crossing southern Minnesota this evening. It will move toward the northeast, and intensify overnight, pulling a cold front across the area later tonight. There could be some rain and snow showers starting about midnight. Precipitation will change to all snow later tonight as colder air moves into the Stateline. Accumulations will not be much, but may total round 1" across northern Illinois by daybreak. With the storm system intensifying as it moves across Wisconsin tonight, a Wind Advisory has been issued for north central Illinois starting at 3 am Sunday, and lasting until midnight Sunday night. Winds will be southwesterly and switch to the west at 15-30 mph tonight with gusts to 35 mph. On New Year's day the winds will be westerly at 25-35 mph with gusts to 50 mph. It will be cloudy with some snow showers or flurries. No additional accumulation is expected. The wind chill is expected to be near zero by Sunday evening, be in the -5 to 5+ range overnight, right through the day on Monday. The winds Sunday night will be 20-30 mph with gusts to 40 mph, and on Monday the wind diminish a little, but still be quite strong from the northwest 15-30 mph with more gusts to 40 mph. On Monday it will be partly cloudy with high only around 20 degrees, and the overnight low on Monday night will drop to around 8 degrees. If that occurs, it will be the coldest temperature so far this winter season. Tuesday will be mostly sunny, but cold, with a high in the low 20's. The cold air will retreat off to the east on Wednesday, and temperatures will recover very nicely to the low to middle 30's. That's back above normal again. The warming trend will continue for the rest of the work week. There will be a good amount of sunshine with temperatures up near 40 on Thursday and into the middle 40's on Friday. WELL INTO THE 50S IN MO. JET DIVING IN BEHIND THE TROUGH. Winter Weather Advisory for Green County in southern Wisconsin 3am to 9am Sunday morning. Wind Advisory for Jo Daviess County in northwest Illinois and Green, Rock and Walworth counties in southern Wisconsin through Sunday night. First for today: The fog has been slow to leave southern Wisconsin and northern Illinois this morning and will likely last through the early afternoon. As a result of the fog temperatures have been slow to rise and if we keep the fog and low clouds around temperatures will not likely reach the low 40s until possibly later tonight once strong southerly winds move in. Second forecast concern will be the next low that is currently moving out of the central Plains. Some of the morning model runs have started to come in and are beginning to track the low further south than previous forecast. The general storm track is now from the Iowa/Missouri border this evening to near Dubuque by midnight and into the Great Lakes by Sunday morning. With more of the southern track I'm a little more concerned with the possibility of some accumulating snow for some Sunday. Right now a Winter Weather Advisory is in effect for Green county and points north and northwest for early Sunday morning. Light rain, especially west of Rockford, may initially begin along the front later tonight and then change over to snow once the cold front passes. With winds increasing tonight this will cause temperatures to drop and what ever snow is falling to blow around reducing visibility - especially in the locations that are under the Winter Weather Advisory. Half an inch to two inches of snow will be possible. Next concern will be the wind. Behind the front west/northwest winds will come howling in sustained around 30 mph with gusts as high as 45 mph. These winds will begin late tonight and last through Sunday. This will make travel difficult early Sunday morning. With such cold air coming in and falling temperatures the light snow may continue into Sunday afternoon. Be sure to join meteorologist Eric Nefstead tonight for all the latest weather information should any advisories be extended. Of course, we'll continue to update you here on the blog, Facebook and Twitter! A Mild End to 2010... A Cold Start to 2012! It was warm enough so that almost all of the precipitation associated with last night's and today's clipper system was in the form of rain. It will be mostly cloudy, and a little colder overnight with a low temperature in the middle 20's. On Saturday sky conditions will vary between partly to mostly sunny. A blustery southerly wind will gust to 30 miles an hour in the afternoon raising temperatures into the middle, and perhaps even upper 40's. This will be a fitting end to a month that has averaged nearly 7 degrees above normal. A cold front will move into the area on New Year's Eve. There could be some light rain showers before midnight, and some light snow or flurries after midnight. It will be very windy with westerly winds 20-30 mph. The overnight low will be around 30 degrees, but with colder arctic origin air pouring across the Stateline on New Year's day, the temperature will fall into the 20's under mostly cloudy skies that could produce some snow flurries. With a very strong northwesterly wind of 20-35 mph and gusts to 45 mph, the wind chill on Sunday afternoon will be close to zero. The winds will continue to be strong on Sunday night and Monday with more snow flurries. The low on Sunday night will be around 16 degrees, and the high on Monday will struggle to reach 20 degrees. The coldest night so far this winter will be reached on Monday night... around 8 degrees. Is this a sign of a switch in the weather pattern that will bring the Stateline back to the reality of winter? Not necessarily. The zonal pattern that was instrumental in causing December to be so mild will resume later next week. By Thursday temnperatures will be above average once again topping out around 38 degrees, and the Statlene will be back in the low 40's next Friday. Who would have thought that at the end of December we wouldn't have temperatures cold enough to generate snow? Now if we would have had temperatures like the ones we're going to get early next week today, we would have likely been dealing with a good amount of snow! 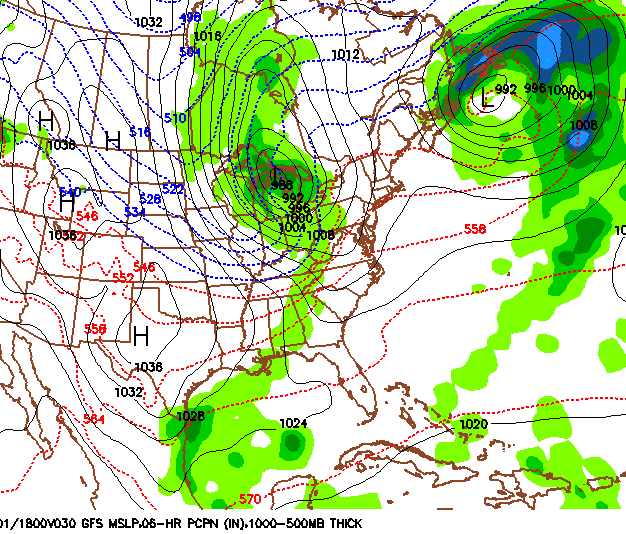 Once this low passes another fast moving 'clipper' type system will move through the Plains and upper Great Lakes. Southerly winds will increase late in the day Saturday helping give temperatures a boost into the low to mid 40s. A cold front will help ring in the new year early Sunday with temperatures falling into the lower 30s by the afternoon. Winds from the north will gust as high as 40-45 mph throughout the day and I wouldn't be surprised if a wind advisory were to be issued Sunday. A true Arctic high pressure will move into the middle of the country late Sunday and that will not only help bring the cold, but also the very dry air. Dew point numbers can sometimes be used as indicators as to what the low temperature will try to fall to on clear, calm nights. Notice how dry the dew points are Monday and Tuesday; in the single digits! This means our temperatures early Tuesday and Wednesday morning hold a pretty good shot of falling into the upper single digits or low teens. It's only a quick shot of cold and then temperatures will warm closer to average towards the end of next week. This image is a surface plot of temperatures, dew points, wind speed/direction, pressure and current conditions. The low pressure is pretty much right over Muscatine, IA and will move east to just south of Chicago as indicated by current pressure falls ahead of the low. There is a brief break in the chilly rain across northwest Illinois but rain will likely begin to wrap back in as the low moves east. It's possible that as temperatures begin to cool into the afternoon and evening that a mix of sleet and wet snow could mix in before coming to an end later this evening. A Winter Weather Advisory will continue for the counties of Green, Rock and Walworth through noon today. Rain mixed with sleet, snow and even freezing rain continues north of the border while rain showers are found across northern Illinois and points south. Low pressure this morning sits between Des Moines and the Quad Cities and will continue east/southeast into the afternoon. As it does, colder air aloft will begin to be pulled down to the surface causing a mixture of rain/sleet and wet snow later this afternoon. Minor accumulations of snowfall will be possible, especially north and northwest. Use caution when traveling this morning! After the clipper system that caused some slippery spots on roads overnight, skies cleared, and with no snow cover and sunshine the afternoon temperature reached 47 degrees in Rockford. The low temperature last night was 29 degrees, so the day averaged an amazing 16 degrees above normal. Every day since December 11th has been above normal. Another clipper system will move in from the west tonight. It could spread some light rain showers into northwestern Illinois by midnight, and with temperatures at or just below freezing, the precipitation may begin as freezing rain in north central Illinois, and some snow will mix in... especially north. A WINTER WEATHER ADVISORY has been issued for Rock and Green coutnies in southern Wisconsin beginning at 2 am on Friday lasting until soon. Accumulations of 1" or so could occur to the northwest of Rockford, and with temperatures right near freezing later tonight, roadways could become slushy, and very slippery. The rain/snow mix is expected to continue into Friday morning. With warmer temperatures in the afternoon, there could be some scattered rain showers. High temperatures will be around 39 degrees on Friday. Friday night will start off mostly cloudy, but clearing is expected, and temperatures will drop into the middle 20's. A brisk southwesterly breeze will develop along with mostly sunny skies on Saturday ahead of the next clipper system pushing temperatures back up into the middle to upper 40's. There could be some light rain showers on New Year's eve, and some snow showers after midnight. A strong Arctic cold front will blast across the Stateline before midnight. The ovenight low on Saturday night will be in the low 30's, and temperatures will not go up much on Sunday. It will be cloudy, and winds could gust from the northwest between 30-50 mph on Sunday. It will be much colder with a high only in the low 30's. Strong winds will continue overnight Sunday night, and with a temperature dropping into the mid to upper teen's, the wind chill will be near zero by 7 am on Monday morning. The high temperature on Monday will only be in the low 20's with a brisk northwesterly wind continuing. The ovenight low on Monday night will match the coldest temperature Rockford has had so far this winter which was 10 degrees on December the 10th. Tuesday will be sunny and cold with a high of 24 degrees. A warming trend will start on Wednesday with a high in the low 30's, and by Thursday it will be even warmer. Skies will remain sunny through the afternoon before clouds start to creep back in later this evening. The next low/shortwave is already moving out of southwest Canada and will track southeast through Iowa and pretty much right over the Wisconsin/Illinois border. This low is currently forecast to track just a bit further south than the one this morning and looks to have a bit more moisture with it. There are a couple critical elements we need to look at in helping us determine just what type and how much precipitation will fall. Temperatures tonight will likely fall into the low 30s ahead of another warm front that will move through northern Illinois. Precipitation will begin to move in after midnight tonight and possibly fall as rain early on. Forecast soundings, which are like a snapshot of the different layers of the atmosphere, indicate the temperature profile to be above freezing aloft, however near freezing at the surface. Initially mixed with the rain could be another dose of light freezing rain or sleet. There will likely be a mix or change over to a wet snow as the low moves closer towards daybreak Friday. It's even possible that a slushy one to two inches of snow will be found across southern Wisconsin. Another factor at play will be the dew points. Typically, when you have a dew point that's below 30° your atmosphere is likely able to support what is known as 'evaporative cooling'. The slightly dry air would allow the rain to evaporate and since evaporation is a cooling process, the surrounding air would cool allowing for a change over to wet snow. There could be an additional rain/snow mix going into the early afternoon Friday. Light freezing rain fell across southern Wisconsin and parts of northern Illinois early this morning. Roads were slick with black ice reported across parts of northern Illinois, but conditions in southern and central Wisconsin are a little worse. While we had some light rain mixed with the freezing rain nearly all the precipitation fell in the form of freezing rain/sleet/snow further in Wisconsin. Click on the link below for updated information on the current roads. Freezing Rain Advisory for Walworth county has been canceled. Conditions will gradually begin to improve through the morning. (7:14:09 AM) nwsbot: LOT: Lakemoor [Mchenry Co, IL] trained spotter reports SNOW of E0.0 INCH at 07:06 AM CST -- moderate amounts black ice near route 120 and highway 12 in volo. 1/8 inch snow pellets 659am - 702am. Light showers mixed with light freezing rain fell overnight and that has caused a thin glaze of ice on some of the roads early this morning. There is a Freezing Rain Advisory for Walworth County in southern Wisconsin until 9am as a warm front lifts through southeast Wisconsin and northeast Illinois. Slick roads may continue through this morning before temperatures rise into the lower 40s late this afternoon. Another storm system will move in late tonight and produce a mix of sleet/snow/rain by early Friday morning. There may even be a brief period of wet snow as this system moves through with minor accumulations. After being mostly cloudy all day, clearing took place in the Rockford area just before sunset. With a warm front lying just off to the southwest, and a disturbance over the northern plains, clouds will spread across the area once again early tonight. The disturbance associated with the front could cause a little light snow after midnight. With warm air above the surface and temperatures at the surface just a few degrees below freezing, the light snow may change to light freezing rain. Caution is advised across the Stateline for the possibility that roads may become glazed causing treacherous driving conditions. Temperatures will rise above freezing early in the morning on Thursday ending the threat. It will become breezy under partly cloudy skies, and much warmer with an unseasonably high afternoon temperature of around 45 degrees. Another in a series of disturbances will roll into the area on Thursday night. There appears to be a little better set up, and more moisture avaiable so that a rain/snow mix are likely. No snow accumulation is likely because overnight temperatures are expected to remain above freezing. There could be a little rain/snow mix lingering into Friday morning. Temperatures in the afternoon will rise to near 40 so that any precipation that falls in the afternoon will be in the form of light rain. Another surge of unseasonably mild air will push across the Stateline on Saturday taking temperatures back into the middle 40's. A system will be approaching northern Illinois on New Year's Eve. so it will become mostly cloudy, and there is a slight chance of some light rain showers with a low in the middle 30's. It will be partly cloudy, windy, and turning colder on Sunday with a high of 38 degrees early in the day, but temperatures will be falling all day reaching the upper 20's by late afteroon. Overnight lows on Sunday night will drop to the low 20's, and high's will only be in the middle 20's on Monday. That's quite a shock compared to what we are used to. Temperatures will moderate by midweek. As Meteorologist Eric Nefstead mentioned in a previous post, temperatures through the remainder of the year will be above average and December will likely go down as one of the top ten warmest Decembers on record. A lot of the cold, arctic air has been bottled up north with the polar jet stream and really hasn't had much of an opportunity to make much progress south. A lot of this has to do with the fact that there isn't a blocking high near Greenland like there was last year. Even though we've had a few cold days the frigid air doesn't stick around because it can quickly move east. The next several days will feature more of the same with temperatures in the upper 30s/low 40s. The jet stream pattern basically runs from west to east (zonal flow) which also allows weak disturbances to move across the northern tier of the U.S. The first will move through tonight followed by another Thursday night. The latter may track a little further south which will likely increase our chance for a rain/snow mix by Friday morning. It does look like colder air will move in for the first couple days of the New Year, but temperatures will fall closer to what our average highs should be for this time of year so it will really only feel cooler because we're used to those mild temperatures. Above Average for the Rest of the Year! As of December 27th. there have only been 3 days that have failed to be above average this month. With temperatures in the middle 30's on Wednesday, and 40 degrees or better Thursday through Sunday, December of 2011 will go down in history as one of the mildest Decembers on record.... somewhere between the 5th warmest and the 8th warmest for sure. The month has had only 1.7" of snow so far, and very little is expected before the end of the month. There could be a little snow mixed in with some rain as a Pacific system slides across the area on Thursday and Friday. It will be partly cloudy on Wednesday with a high in the middle 30's. The wind will switch to the south holding temperatures in the high 20's ovenight on Wednesday night. On Thursday a new system will approach from the west in our fast moving west to east progressive air flow. It could produce a light rain/snow mix on Thursday morning. With a high around 41 on Thursday, there will not be any accumulation of snow. Another disturbance could cause some rain or snow, or a rain/snow mix on Thursday night and Friday. Precipitation is expected to be light, and again there should not be any accumulation of snow with a high on Friday in the low 40's. A strong southwesterly air flow will develop on Saturday pushing temperatures into the middle 40's. Southern parts of Lee and DeKalb counties could be close to 50 degrees on Saturday afternoon. New Year's Eve is expected to be dry with an overnight low in the low 30's. Colder weather will move into the Stateline later on New Year's day, and last through early next week. ...we could have woken up to more than just cloud cover this morning. An area of low pressure is moving up through the Ohio River Valley this morning while a cold front passes through northern Illinois and southern Wisconsin. Light, wet snow has been reported across east-central Illinois and northwest Indiana where evaporative cooling has caused the rain to either mix with or completely change over to snow. The cold front is also helping to provide the cooler temperatures and will continue to push the rain/snow through Indiana, Michigan and Ohio through this evening. If this system would have tracked a little further north and west, we could have been waking up to an inch or more of snowfall this morning! Travel out east may become a little slick, especially on untreated roads. Closer to home, a few sprinkles or flurries may fly under the mostly cloudy skies. Winds will stay gusty from the northwest keeping temperatures in the middle 30s. Strong low pressure is spinning just north of Minnesota in southern Canada. It has been responsible for our brisk winds on Monday. A southern stream low pressure is centered over Mississippi, and it is moving toward the northeast. The low is far enough away that the precipitation associated with it will just graze the southeastern part of north central Illinois. The northern low is trailing a cold front across northwestern Wisconsin and northwest Iowa. There are some sprinkley light rain showers associated with that front. So, as the front moves east toward northern Illinois this evening, there could be some sprinkles or light rain showers before midinight. It will remain mild overnight with a low around 33 degrees. Our average low this time of year is 15 degrees, and our average high is 30 degrees. Stateline weather this week will continue to be well above average. The zonal air flow out of the Pacific is responsible for our mild weather keeping any serious arctic air from northern Canada from reaching northern Illinois. The front to our northwest will move across the area before daybreak on Tuesday. It will be blustery and colder on Tuesday with a high around 38 degrees. There may be some flurries or snow flurries from noon through late afternoon. Winds could gust to 35 mph from the northwest. A Canadian cold front will move into our area by sunset on Tuesday, so it will be colder on Tuesday night with the temperature dropping to the low 20's. Wednesday will be relatively chilly in terms of what we have seen in recent days, with a high in the middle 30's. A series of Pacific systems will continue to parade across the area for the rest of the week. High temperatures will around 40 degrees or a little higher from Thursday through Sunday. There could be a little light rain and light snow mix from time to time from Wednesday night through Friday. New Year's Eve looks like it will be partly cloudy with temperatures holding above freezing for most of the night. That's not bad for this time of year! It was unsually mild on Christmas Day across the Stateline with an afternoon high at the Rockford airport of 44 degrees. The average high for December 25th is 31 degrees. It was sunny all day, and it will be clear overnight. A mild low temperature in the middle 20's is expected when the average low should be around 15 degrees. A mild zonal flow of air will continue in this week between Christmas and New Years. High temperatures are expected to reach the middle 40's on Monday under sunny skies. A brisk southwesterly wind will blow at 15 to 25 mph on Monday afternoon. On Monday night a pacific type of cold front will pass through the area. Clouds will increase, and there is a slight chance of some light rain or snow showers. Very little precipitation is expected because the air has very little moisture. Tuesday will be partly sunny, and a little cooler with a high in the upper 30's. A re-enforcing cold front will drop in from the north Tuesday night, and it will be slightly cooler on Wednesday under partly cloudy skies. More mild air will rush across the area on Thursday and Friday with more Pacific systems. There is a light chance of light rain under mostly cloudy skies. High temperatures from Thursday into next weekend will be near 40 degrees. It should be a relatively mild dry New Years Eve on Saturday night. 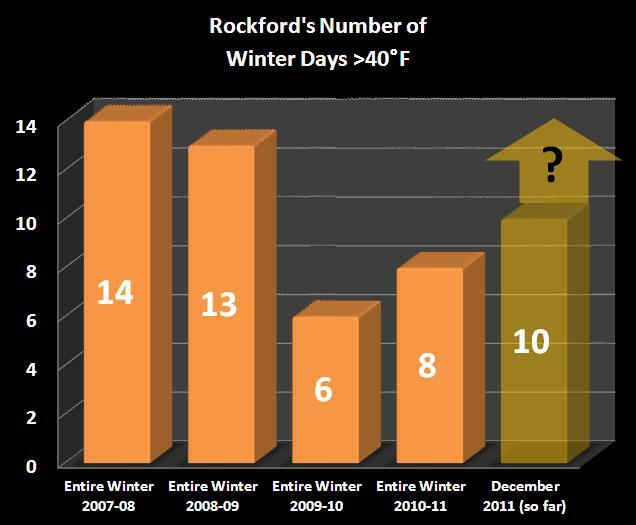 Since Meteorological Winter began on December 1st, Rockford has seen the mercury top 40 ten times already. This is a higher number of 40-degree days than we've seen in each of the past two winters, and this winter is only about 1/4 the way done! We could see 40 degrees either day this weekend, and it's even more likely to occur on Monday. Part of the reason we're seeing these mild temperatures continue is that we don't have any snow cover. Snow reflects sunlight, so heat isn't as easily absorbed by the ground. But this December, any sunshine has been readily absorbed by the ground which heats the air directly above it. There is not any indication of a breakdown in the mild weather pattern the Stateline has enjoyed through December any time soon. Above normal temperatures are expected to continue into the first week of the new year. It's good news for last minute shoppers not having to deal with snow and ice, and the dangerous road conditions associated with winter weather systems. It's also great news for anyone doing any traveling across our part of the Midwest. It is not good news for winter weather enthusiasts, skiers, ice fishermen, and snowmobilers, and of course... those folks who plow snow. Synoptic conditions today show a ridge of high pressure stretching from eastern Wisconsin southwest across the Stateline, through northeastern Missouri across Kansas. The ridge will shift southeast today as a vigorous disturbance near International Falls, Minnesota moves to Wisconsin this afternoon. After an early morning start with temperatures in the upper teens early under clear skies, sunshine will give way to high clouds this morning, and more widespread cloudiness this afternoon. Light snow associated with the low pressure may brush southern Wisconsin with a little light snow during the afternoon, and a flurry cannot be ruled out for the US 20 corridor later this afternoon. However, the air is very dry, and most of the snow that develops will evaporate before it reaches the ground. It will be mostly cloudy with the passing of the trof. of low pressure this evening. Clouds will decrease overnight becoming mostly clear by late tonight. The overnight low will be in the low 20's. On Saturday it will be sunny to mostly sunny, and it will be quite breezy in the afternoon with winds running 15 to 25 mph and gusty. The temperature will top out in the upper 30's. Keep in mind that the average high for December 24th is 31 degrees, and the average low is 16 degrees. On Christmas Eve it will be partly cloudy with a low in the middle 20's. Christmas Day will be sunny to mostly sunny, continued mild with a high around 40 degrees with a strong breeze from the west to northwest. On Monday high pressure will move east of the area, and a strong southwesterly flow will develop in advance of the next system over the plains. Temperatures will be quite mild for this time of year with a high in the lower 40's. The next weak cold front will pass through the area on Monday night as a new disturbance develops over Mississippi. Enough moisture may be in place so that some light rain and light snow showers will develop on Monday night, and continue into Tuesday morning. It will become partly sunny by Tuesday afternoon with a high in the upper 30's. Similar high temperatures can be expected on Wednesday and Thursday. The mild weather that the Stateline has been enjoying in December looks like it will continue through the end of the year. The average temperature so far this month is 33.6 degrees which is 6.4 degrees above normal. Needless to say there isn't any frost in the ground or any ice on area rivers. The frigid air in northern and central Canada does not show any indication of dropping southward into the mid west. A weak cool front will pass though the area by mid day. Early this morning there was a solid band of snow behind the front. Parts of southern through east central Wisconsin received an inch or two of snow making roads slippery is spots. As the band of snow moved east and southeast it completely dissipated. Skies will remain cloudy to mostly cloudy for the rest of the day, and there could still be a re-development of light snow or flurries. Temperatures will remain fairly steady under the clouds, and Rockford's high temperature will be around 36 degrees. Northern Illinois can expect decreasing clouds overnight, and it will be cooler with a low in the low 20's as drier air moves in from the northern plains. High pressure over the plains will take control of the weather on Friday, and it will be mostly sunny with a high around 34 degrees. Although that may seem a little cool, it is still above average for December 23rd. Temperatures will moderate under mostly sunny skies Saturday to around 38 degrees, and it will be warmer yet on Christmas day, with a high near 40 degrees. Needless to say with temperatures that mild, and a dry pattern set up, there is very little chance the Stateline will have a white Christmas this year. A weak front will drop in from from the northwest on Christmas day, but will have no effect on the upward trend in temperatures, so that on Monday the high will be around 42 degrees. It might even get a little warmer than that. The next front will drop temperatures a couple of degrees on Tuesday. At 11:30 tonight -- local time -- astronomical winter begins in the northern hemisphere. This is the time of year where the northern hemisphere receives its least-direct sunlight as the sun's direct rays line-up over the tropic of Capricorn. From this point forward, the sun will appear higher in the sky until the summer solstice on June 20th, 2012. The days will also begin to get longer as the sun's most direct rays continue to migrate northward. However, our average high and low temperatures will continue to decline for a few more weeks. Today, our average high and low are 31 and 16. By the time we get to January 8th, our average high and low are 29 and 13. Our daily averages will stay here through January 22nd, then begin to rise slowly as the sun's more intense rays begin to have an impact on the cold air-masses that typically reach maturity in mid-January. Temperatures will continue to be above normal for at least the next 7 days. The frigid air in northern Canada is being blocked with modified Pacific air barreling across the US. The storm center that dumped heavy snows over the panhandle of Oklahoma into western Kansas moved right across the Stateline late this morning. Obviously, it has lost almost all of it former capabilities and characteristics. It did cause some light rain showers to scatter across northern Illinois, and move toward the northeast. The dense fog that blanketed northeastern Illinois earlier in the morning has lifted. It will remain cloudy through the early afternoon, and there will continue to be a patchy light fog, and possible some drizzle. Drier air will move into the area later this afternoon, the clouds will start to break up, and with some sunshine, the temperature will top out in the upper 30's to around 40 degrees. Skies will be partly cloudy overnight, but there could be another round of patchy fog that will begin it's development before midnight, and persist through the night. It will be colder than last night with a low near 27 degrees. It should be noted the that is still well above average. Our average low this time of year is 16 degrees. A new cold front will push toward the southeast across the area between midnight and 6 am on Thursday. It is not a strong front for this time of year, and our high temperature on Thursday will still manage to rise to around 37 degrees, when are average high is only 31 degrees. Thursday will start of partly cloudy, but clouds will increase, and there could be a little post frontal light snow. Very little snow is expected, and what falls should melt quickly on the roadways. A little modified Canadian air will push in from the northeast across the Great Lakes on Thursday night dropping temperatures down into the low 20's. On Friday and Saturday high pressure will move across the Midwest allowing lots of sunshine along with high temperatures around 34 degrees. Saturday will be mostly sunny with a high of 34 degrees, and on Christmas day it should be partly sunny and top out near 36 degrees. On Monday it will be close to 40 degrees. So far during the month of December the temperature has averaged 6.7 degrees above normal, and Rockford has had only on day when the temperature failed to reach 32 degrees. There is a lot of Christmas shopping to be done yet, and most people have some travel plans during the next several days. The roads should be in good shape for most of the time leading up to and past Christmas. The Radar can be Misleading! Even though doppler radar isn't picking it up in many cases, there are areas of light drizzle across much of the Stateline this evening. Precipitation -- like this -- that is so light and low to the ground will often sneak underneath the radar beam. For example, it's currently drizzling here at the station on the far west side of Rockford, but the national composite radar image does not show it very well. It is still possible that temperatures will touch the freezing point briefly tomorrow morning, so travel with caution! A band of moderate snow (reports of big flakes coming down) has lifted into southern Wisconsin and will continue to lift north through the afternoon. Additional precipitation, mainly light rain, is falling to our south and this will continue to lift north into the evening. Accumulations of any rain/sleet/snow are expected to be light (should it accumulate at all). Watch for slick spots later tonight and early tomorrow morning with temperatures reaching slightly below the freezing point. 12:30pm Update: The precipitation is having a hard time making much progress north late this morning, however, we could still see a few light bands of light rain/flurries into the afternoon as the dew points continue to rise. In fact, there are a few bands beginning to show up across northern Illinois. These will continue to lift north into southern Wisconsin. Look for light rain mixed with snow/sleet into the afternoon. Coverage may increase into tonight. A developing low pressure system in Oklahoma will continue to move northeast into Missouri, southern Illinois and eventually into Ohio by Wednesday afternoon. High pressure over the upper Midwest earlier this morning was keeping a good amount of dry air flowing in the mid levels of the atmosphere. The high pressure will eventually move east and this will allow some moisture to move northward into the late afternoon and evening as the low lifts into southern Illinois. The leading edge of the precipitation was right along the Missouri/Iowa border extending east through Peoria and east-central Illinois. Along the leading edge a mix of drizzle, light rain and very light freezing drizzle (especially along the Missouri/Iowa border) were noted on surface observations. That's because temperatures were close to freezing but dew points also remained below 32°. As dew points rise today, especially south of Rockford, the atmospheric column above us will become saturated enough to possibly see a change over to light rain while mixed precipitation may be found closer to the Wisconsin/Illinois border. Precipitation amounts will remain very light this evening so accumulations are not expected to be much. The low will move to our southeast tonight with drizzle and fog possible. Surface temperatures overnight may dip just below freezing and that could cause light freezing drizzle, or maybe a rain/snow mix into Wednesday morning which could cause a few slick spots during your morning commute. As Meteorologist Candice King said in a previous post, precipitation-type will be a challenge to forecast during this next round of winter weather. The area of low pressure that will be passing to our southeast on Tuesday evening will initially throw warmer air in our direction, followed by colder air on Wednesday morning coming in on its back side. Plus, a chilly area of high pressure to our north will complicate the Stateline's temperature profile with its shallow layer of cold, dry air trying to hold-on at the surface. Blizzard Warnings have been issued for northeast New Mexico, the panhandles of Texas and Oklahoma along with western Kansas in anticipation of the next low. While big wintertime snow is expected in those locations, our weather will feature a bit of everything - from a rain/snow mix, sleet, rain, freezing rain and possible snow. A weak cold front will move through later this afternoon and stall just to our south late tonight. This should help keep most of the precipitation south of the viewing are overnight. The general track takes the low from west Texas today, southern Missouri and central/southern Illinois by Tuesday and then into Indiana by Wednesday morning. This barely puts us on the 'cool' side of the storm as warm air is fed in from the south. As a result, temperatures will be pretty critical as to just what type of precipitation falls during this time frame. With temperatures falling below freezing tonight any moisture that would be able to creep this far north would likely fall as snow or a rain/snow mix early Tuesday. Temperatures are expected to rise above freezing during the afternoon Tuesday so this should allow for any precipitation to fall as rain. It appears as if a dry-slot (dry air in the mid-levels of the atmosphere) will move in on the southern edge of the low which could cut off the precipitation for a brief period into Tuesday evening. The low will move just to our south sometime after midnight and continue northeast Wednesday morning. This, along with better forcing in the mid and upper levels, will help generate precipitation again but by Wednesday morning temperatures will be either right at or slightly below freezing. This could cause a mix of sleet/snow/freezing rain to fall by Wednesday morning. If temperatures were to remain above 32° then some of this would melt and not likely accumulate. Travel Tuesday night into Wednesday will become slick especially if we get a brief period of freezing drizzle/rain. Total precipitation amounts during this period are not expected to be high but could be just enough to cause a few headaches. If there is a quicker transition to snow Wednesday morning there could be some minor accumulations. Temperatures during this whole process at the surface and above will be critical as to just what type of precipitation we receive and for how long. Anyone with travel plans during this time should keep up with the forecast and we'll continue to provide updates right here. What a beautiful day!!! Sunday was near perfection with sunshine, blue skies, and mild temperatures for this time of year. 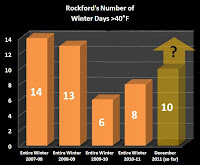 The high at the Rockford airport was 41 in the afternoon, and reached again at 10 pm. The average high on December 18th is 32 degrees. The high temperature on Monday should occur shortly after midnight, around 40 degrees. That mild air flow from the southwest will keep temperatures above freezing ovenight. There will be and increase in clouds by late tonight in advance of a cold front that will pass across the Stateline around 6 am Monday morning. The front will not produce any precipitation as it moves through. It will be partly to mostly cloudy in the afternoon on Monday with a northerly breeze, and temperatures in the 30's. The high pressure following in behind the front is Pacific in origin, so no really cold weather is expected. A significant storm system will cross the southern Rockies, and move into the Texas panhandle by Monday evening. Near blizzard conditions with heavy blowing snow will set up over the northern Texas panhandle, the panhandle of Oklahoma, southeastern Colorado, and southwesern Kansas. That area could recieve a foot to a foot and a half of snow. The low will move from Oklahoma on Tuesday morning to southwestern Missouri by Tuesday evening and weaken. There is a chance of some light snow across the Stateline on Tuesday morning, and possibly a light rain-snow mix during the afternoon. There is a good chance of light rain and light snow on Tuesday night... that could linger into Wednesday morning. Very little accumulation of snow is anticipated at this time for northern Illinois.... possibly a few tenths of an inch, but day time temperatures are expected to by in the middle to upper 30's, so whatever snow that falls should melt. The low will move to western Indiana by early Wednesday morning, and off the New England coast by Thursday morning. It will be followed another cold front with high pressure of Pacific origin behind it again. So, no frigid air from northern Canada will chill the Stateline during pre-Christmas week. Highs will be in the 30's, and lows will be in the 20's from Thursday through Christmas Day. Right now it looks like we will not have a white Christmas, but stay tuned. If the system coming through Tuesday and Wednesday intensifies, and takes a path from Quincy to Kankankee...we could be in for some decent snow. The disturbance that caused the snowfall across the area overnight has moved well off to the east. Skies will clear overnight as a broad area of Pacific high pressure takes full control of Stateline weather. The average low temperatures this time of year are around 17 degrees. It will not get that cold tonight despite clearing skies. The overnight low is expected to be in the lower 20's. Sunday will be sunny and warmer. It will become breezy in the afternoon with a high close to 40 degrees. Sunday is the pick day of the week. The rest of the week our area will see highs in the 30's, and be warmer than average for this time of year. A low pressure system will pass well to the south of the Stateline on Tuesday through Tuesday night. It is not a particularly strong system, and the distance will keep our chance of precipitation low on Tuesday when there is a slight chance of some light rain showers. On Tuesday night there is a slight chance that some light snow showers could mix with the light rain showers... especially to the north of Rockford into southern Wisconsin. If the system tracked just a little farther to the north, was stronger, and was able to draw more cold air, then there would be better chances that the Stateline would see a White Christmas. The only other chance of snow before Christmas is with the passage of another Pacific type of cold front on Friday. Really it does not look like much of a chance at all because it appears as if our area will only receive some flurries with that system. Richard in Rock City: 2"
Steve in Stillman Valley: 2"
SNOWFALL TOTAL ABOUT 2.5 INCHES. 24 HOUR SNOWFALL. STOI2 COOP. 24 HOUR SNOWFALL. EZBI2 COOP. 7 HOUR SNOWFALL TOTAL. SNOW DEPTH IS 3 INCHES. ESPOTTER ST157. SNOW SO FAR SINCE 10 PM. STILL SNOWING. 0.7 INCHES OF SNOWFALL. MODERATE SNOW CURRENTLY FALLING. Light snow is beginning to show-up in parts of Stephenson and Jo Daviess county this evening. The disturbance associated with this snow has had a history of producing between 0.5" and 2" in southeastern sections of Minnesota. Similar amounts are possible across the Stateline, with most areas seeing the lower-end of this range. High pressure dominates the immediate weather this afternoon but an upper level disturbance in the Plains will move into southern Wisconsin and northwest Illinois late tonight and could bring light snow showers with it by Saturday morning. After that eyes turn to the southwest for what could potentially be another weather-maker for the lower Great Lakes. The low pressure system is now just entering in the southwestern U.S. and as it does it will become cut-off from the main flow in the jet stream. The problem with forecasting this low the past week has been the fact that it has been over a data void Pacific ocean. Other than a few buoys we had no atmosphere sampling of this storm. Now that it has moved onshore, our weather instruments will be able to actually gather data from the system and that's what will be fed into our weather computer models. Early this morning, the 'general track' (and I use that term lightly) has been for the low to move out of east Texas, into Missouri and somewhere through southern Illinois. It's a matter of just how far north or south the low goes that will determine what type of precipitation we will have. A more southern track would mean the chances of getting anything would be slim and a more northern track would increase the chance of receiving rain rather than snow. At this point, it looks like the precipitation may start out as rain Monday afternoon with possibly a rain/snow mixture Monday night. As the low moves into Indiana and Ohio by Tuesday we could see a change over to snow by Tuesday afternoon. The National Weather Service GFS model early this morning had some accumulating snow for Tuesday while the Canadian completely missed us to the south. The devil is in the details and these details will get ironed out within the next 48 hours. Stay tuned! The Climate Prediction Center has released the latest January outlook and it doesn't look too good for all the snow lovers out there. Northern Illinois and Southern Wisconsin hold about a 40% chance of having above average temperatures during the month of January and a slight chance of above average precipitation. Now that's doesn't mean we won't experience a few cold outbreaks, but the month overall appears to remain mild. As mentioned in previous posts, the NAO has been positive and unfortunately looks to stay that way. There doesn't appear to be any major big pattern changes in the works to break this down. We're also lacking in significant snow accumulation across the lower Midwest and Great Lakes. Storms will tend to track where the greatest temperature gradient lies. In the winter the snow pack can sometimes provide that with the colder temperatures over the snow and the warmer temperatures where the snow is lacking. With no major snow packs around our area we really haven't set up that temperature gradient so storms may be more prone to a northward track keeping the Great Lakes on the milder side. From 1971 to 2000, the average chance of a white Christmas in Rockford was 43%. In Freeport, it is significantly higher at 56%. For more information, see this article by Dr. Jim Angel. You wouldn't know it if you were outside during the daylight hours today, but we nearly tied a record high temperature in Rockford this morning! Just before a cold front reached the area in the wee hours of the morning, the Rockford airport's temperature hit 56 degrees. (The record high for this date is 58 degrees, set back in 1971.) Of course, temperatures dropped from there as that cold front continued eastward and gusty west-northwest winds bought more seasonable air into the Stateline. If you were to look at a U.S. snow cover map from December 2010 and compare it to the current U.S. snow cover you would notice quite a difference. This time last year we were dealing with several inches of snow and this year...none! Places in New Mexico still have snow on the ground from recent storms. While we have entered into another La Nina pattern the colder outbreaks have not been as frequent because the major storm track has been, for the most part, positioned from southwest to northeast. This has left us on the 'mild' side of the jet stream. Sure, we've had a few cold spells but temperatures have been running above average for awhile. A big factor as to why it's been fairly mild and quiet is the fact that the NAO (North Atlantic Oscillation) has been positive - read more on the NAO here. Last year, as with previous years, the NAO was negative which allowed more cold air to move south, keeping the storm track south and giving us the colder and snowier December. This year the NAO has remained positive which keeps the jet stream further north not allowing the cold air to invade the southern states. Unfortunately, it doesn't look like this pattern will break any time soon. Hard to believe temperatures around midnight were in the middle 50s! "Not so bad" you may be thinking to yourself, but don't get too excited. West winds and thick cloud cover will keep the temperatures falling through the 40s this morning and eventually into the low to mid 30s later today. Wind gusts today could reach 30-35 mph keeping wind chills in the 20s. Here are some rain totals from across the Stateline so far through this evening. As you can see most of the heavy rain fell in areas to the south of Rockford, with even higher totals to the south and east of our viewing area. Tonight we'll have to deal with some patchy drizzle and fog until a cold front pushes through the area sometime around 3am. This front will bring drier air into the region. Although a few more rain showers are developing in eastern Iowa immediately along this approaching cold front, additional rain totals should only amount to a tenth of an inch or less. A Dense Fog Advisory has been issued for Jo Daviess county until 6pm. Visibility less than a quarter mile will be common across parts of southern Wisconsin and northern Illinois. Locally dense fog and scattered showers will continue tonight. Expect the fog to last into the overnight and early on Thursday. Copious amounts of moisture have been pulled north this morning leading to anywhere between a half an inch to over an inch and a half of rainfall since the rain started late yesterday evening. Heavier showers now passing through the Rockford Metro will continue east into Boone county with another band of heavier rain south of Dixon. There have been a few thunderstorms noted south of Davenport this morning but those will continue east and not have an impact on us in the near term. Low pressure will continue to develop in response to a strong upper level trough in the southwestern part of the U.S. That low will lift out of Kansas and into Iowa by later this afternoon. As it does, it will pull a warm front closer keeping the rain threat going - even though we may get a break from the rain here and there. Also of note is a dry-slot just to our southwest which may aid in further development of rain and embedded thunderstorms. While storms, should they develop, are not expected to reach severe limits they could produce small hail especially since they would remain elevated. Another issue this morning is the fog. With all the moisture streaming northward the dew points have become very close to our temperature readings. Dew points will continue to rise along with the temperature through the afternoon so the fog will likely stick around into tonight and some of it may become locally dense. Be careful when driving this morning as the heavier rain showers have likely caused ponding on some of the roadways. Dixon (weather watcher 6am): 1.2"
Fog & Rain... Tricky Wednesday Travel? Moderate to heavy rainfall is occurring in central Illinois and southeast Iowa as of this writing, and indications are that this rain will soon be in the Stateline. Indications are that 1.5 to 2" of rain will fall across much of the area before all is said and done late Wednesday night and Thursday morning. In addition to the rain causing ponding on the roadways tomorrow morning, motorists will want to keep an eye out for fog. Fog is already forming around Rochelle and DeKalb this evening, and will quickly spread northward tonight as rain continues to saturate the low levels of the atmosphere. Fog will be a problem through early afternoon tomorrow, and will probably thin-out later in the day as southerly winds and a warm frontal passage help temperatures separate from the dewpoint. Rain, however, will continue into the evening making travel a little slower than normal. What has happened to our snow this season? The past several Decembers have produced accumulating snowfall the first week and a half into the month but this year has turned out to be just a little different. The general track of storms has been, for the most part, southwest to northeast - putting northern Illinois and southern Wisconsin on the warmer side of storm systems. The one developing in the southwestern U.S. will be no exception. It's hard to believe that New Mexico has seen accumulating snow before Rockford! We have entered into a La Nina pattern, but we have to look a little deeper into what's causing this lack of snow and cold. It wasn't but just a couple months ago signs were pointing to a snowy and cold start to winter, and that may still be the case later in the winter season, but there's one factor that we also have to look at: the North Atlantic Oscillation (NAO). Discovered by Sir Gilbert Walker back in the 1920's, the NAO is basically the difference in atmospheric pressure patterns in the middle and high latitudes over the North Atlantic Ocean. Last year we spent a majority of the winter in the 'negative' phase. This featured a blocking high pressure over Greenland which helped push the jet stream south across the U.S. allowing for cold, arctic air to surge over a good portion of the country. For the past several weeks the NAO has been in its 'positive' phase which features an area of low pressure over Greenland and as a result keeps the jet stream further north across the U.S. Taking us into the present time and the storm that brought rain and snow in the southwest Monday will track to our west from Kansas through north-central Iowa Wednesday before lifting into the upper Great Lakes Thursday. High pressure over the southeastern U.S. will allow moisture from the Gulf of Mexico to be in full swing and strong southerly winds both at the surface and a few thousand feet above will help transport the moisture northward. Rainfall totals reaching an inch or more remain possible heading into Wednesday night. Once that system has passed the weather should remain quiet until early next week when another low develops and could possibly take a similar track as the one moving in tonight. The difference between the two is we might not have as strong of high pressure in the southeast pushing the low to our west. After that passes another looks to develop around the 22nd of December and this one could yield a little snow just in time to make it a white Christmas. We'll have to wait and see, but climatology tells us the later we get into the winter months without adding on the snow we may be running below our average snowfall. Keep in mind, though, that all it takes is one storm to put you right back at or above. Thanks to a mild weather pattern featuring southwest flow aloft, the first 12 days of December have only produced 0.1" of snowfall in Rockford. This is in sharp contrast to the last five years -- all of which have seen over 8" of snow in the first 12 days of the month. But considering our average snowfall for the entire month of December is 10.8", one could argue that we were due for a dry 12th month. The next weather system forecast to move in looks to bring mild, but wet, weather into the Great Lakes towards the middle of this week. As with previous systems, it appears as though we'll remain on the warm side of the next low forecast to move north from the southern Plains and pulling in a decent amount of gulf moisture with it. Precipitation may start as early as Tuesday evening as a warm front lifts through Illinois. With temperatures Tuesday night close to freezing the precipitation may start off as a mix before changing to all rain Wednesday. With the amount of moisture expected to be pulled north, it's possible close to an inch of rainfall may be seen; the majority of it falling Wednesday into Wednesday evening. A few showers may be leftover Thursday morning before colder air moves in Thursday afternoon. After that system the weather will quiet down until early next week when another system looks to develop late Sunday into Monday. Again, it looks like we'll stay on the warmer side resulting in mainly rain. That system clears out by the middle of next week only to be followed by another one which could move in around December 22nd. While it's not great, we may be able to squeeze a little snow out of it by the end of next week. The chance of that looks low, however, so I wouldn't get too excited just yet. A Freezing Rain Advisory will continue for about another hour for counties in southwestern and western Wisconsin. A weak upper level disturbance moving out of the Plains this morning has provided enough lift to generate a few light showers. However, temperatures overnight have been holding steady right around the freezing point which may cause a little freezing drizzle to mix in with the showers. There is not threat for the immediate Stateline but if your travel takes you west of Monroe or north of Madison you may encounter a few slick spots on the roads. Drizzle or even a light shower will remain possible for our western counties today while the mostly cloudy skies will stick around for the rest of us. High pressure is sitting over New Jersey this evening. It is very large, and continues to dominate Stateline weather overnight. Skies will be clear to mostly clear this evening, but the southerly wind flow on the back side of the high will keep temperatures from dropping too much. The southerly winds will bring more moist air, and some clouds in from the southwest later tonight. The low temperature overnight will be in the middle 20's. Clouds will continue to increase, lower and thicken, on Monday, and there could be some very light rain showers or sprinkles on Monday. The high on Monday will be around 38 degrees, and the low on Monday night near 31 degrees. Stratus low clouds will shroud the area on Tuesday as the atmosphere continues to moisten up with a continued southerly air flow across the area. Temperatures will moderate with a high in the low 40's. Rain will spread across the area on Tuesday night as low pressure begins to develop over the Texas panhandle. The temperature overnight is expected to hold in the middle 30's. Low pressure will be over southeastern Colorado by early Wednesday, and a warm front will be poised east-west across southern Illinois westward across northern Kansas. 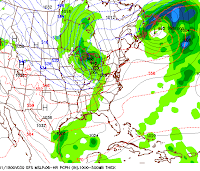 The low will intensify as it moves rapidly northeast on Wednesday. The track will take it well to the west of the Stateline so all of the precipitation with this system will be rain. It will be cloudy, rainy and mild on Wednesday with a high in the middle 40's. The warm front will push across northern Illinois on Wednesday night with more rain showers, and possibly even a thunderstorm. The low on Wednesday night will be near 40 degrees, but a cold front will sweep across the area on Thursday morning. Temperatures will reach the low 40's before brisk northwesterly winds cause the temperatures to drop slowly for most of the day. Canadian high pressure will bring colder air, and clearing skies to the area on Thursday night. The low will be near 23 degrees early Friday morning. Friday will be mostly sunny and colder with a high only around 30 degrees. That large cold area of Canadian high pressure has slipped off to the south and east of the Stateline. It is still close enough that skies will be clear overnight, but it will not be as cold as last night when the temperature dropped to 10 degrees. That 10 degree low was the coldest temperature recorded at the Rockford Airport since February 11th, when it dropped to 2 degrees. Tonight, with southerly winds the low will be in the upper teens. On Sunday it will be sunny, breezy, and warmer with a high temperature in the upper 30's. The wind will be south to southwest between 10 and 20 mph, with some afternoon gusts to 25 mph. The southwesterly winds will continue on Sunday night, and temperatures will continue to moderate. It will still be mostly clear on Sunday night with a low around 27 degrees. Moisture from the Gulf will reach the Stateline on Monday. The skies will cloud over holding temperatures in the upper 30's for highs, and there could be some patchy drizzle or light rain showers in the afternoon. The drizzle may last through the night Monday night, and with temperatures dropping to freezing or just below, there could be some freezing drizzle . So, look out for the possibility of slippery roads and sidewalks on Monday night. On Tuesday it will continue to be mostly cloudy, and with a weak front sliding though the Stateline, temperatures will be in the 30's, and there could be some light rain or light snow showers. No significant precipitation is expected on Tuesday. On Wednesday a warm front will be located across central Illinois. It will be cloudy and warmer with a high in the low 40's. With moisture over-running the front there will be a good chance of showers. The warm front will approach the Wisconsin-Illinois stateline on Wednesday night. Rain will be likely, and there could be some significant rainfall totals. Estimates at this time range from .50" to around 1.50". A cold front will sweep across the area by daybreak on Thursday. High temperatures on Thursday, in the low 40's, will occur in the morning, and temperatures will fall in the afternoon. It will be mostly cloudy, and there could be some lingering showers. Colder air will move in on Thursday night dropping temperatures into the middle 20's. It will be partly cloudy on Friday, and chilly, with a high only around 30 degrees. Despite the sunshine in place today it's going to remain very cold this afternoon. A continued feed of cold air from the northwest will keep temperatures rising much past the low 20s. In fact, they may even begin to drop some later this afternoon. Winds will become a little breezy and that will keep wind chill values today in the teens. Tonight, the center of the arctic high will move into the Great Lakes and this will allow temperatures to bottom out very quickly once the sun sets. It's possible you may wake up Saturday morning to single digit readings! To make matters worse, the slightest bit of wind will put wind chills below zero. These numbers are our in-house model wind chills by 7am Saturday. Keep in mind that some locations could have wind chills below zero early tomorrow morning. So if you've got an early shift or you have to let the dog out, but on the layers! It's going to be COLD! The sunshine this morning has given us a first look at the little snow that fell overnight. Some of you didn't see any snow, some just had a dusting and others had enough to cover the streets and sidewalks. It's pretty neat to see the little snow that did fall just to our south as the clouds continue to move out. You can tell where there is snow because when a visible image is put into animation, the clouds move while the snow doesn't! We'll continue with the sunshine today, but it's going to remain cold! Wind chills in the teens this afternoon! Thank goodness it didn't snow more! A total lunar eclipse will be visible across portions of the United States on Saturday morning. Although the best viewing will occur along the west coast and Alaska, we'll be able to see part of the event here in the Stateline. Roughly the upper-left quarter of the moon will start to become somewhat darker -- or reddish -- at about 6:45am. The moon will set at about 7:14am; and will be hidden from our view when the total lunar eclipse occurs over the western U.S.
What will be unusual about this lunar eclipse is that it will be happening at sunrise. So we'll have a moment where both the rising sun and the setting moon will be visible on opposite horizons. This can happen because of an optical phenomena called atmospheric refraction. When light enters the earth's atmosphere, it bends slightly (or refracts). This makes objects to appear higher in the sky than they actually are. If you do plan on watching the event, make sure you have a good view of the west/northwest horizon and that you bundle-up out there! Temperatures will be in the single digits and teens across the area on Saturday morning. The good news is visibility should be good that morning with mostly clear skies expected. 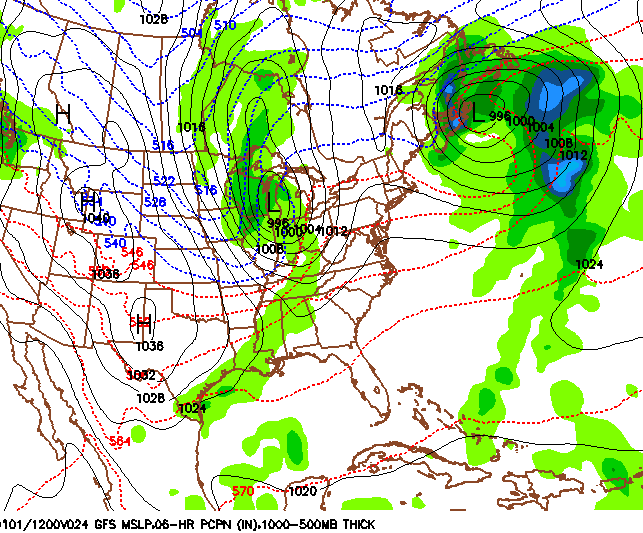 Heavy rain possible next week; Some snow just in time for Christmas?? An upper level disturbance moving through the Plains late this morning will continue to bring snow to Nebraska, Iowa, Illinois, Indiana and Michigan by Friday morning. While we may get a dusting or quick inch from this whatever would fall wouldn't last until Christmas. The next big system forecast to move in would by towards the middle to end of next week with another low developing in the southwest and lifting somewhere in the Midwest. The image on the left is the latest run of the GFS weather model which takes an area of low pressure from the panhandle of Texas/Oklahoma and lifts it northward into northern Missouri by next Thursday morning. If this track were to hold true it would put us on the 'warm' side of the system likely leading to a good amount of rainfall by the middle of next week. On the flip side, if it were to track a little further east and south we would be on the colder side of the low which would mean a higher chance of a mix or snow. 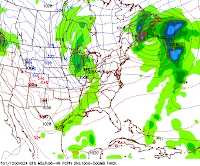 Looking out even further ahead in model 'la la land' - which according to Meteorologist Eric Nefstead, "It's fun to go out in model la la land sometimes" - could mean some snow just in time for Christmas. Now before you get too excited remember this is over two weeks away and things will change, BUT if an area of low pressure were to develop in the southern Plains near Texas or Oklahoma and there be enough cold air in place keep the low to our south - kids across the Stateline could be waking up to a white Christmas. Something we'll definitely keep tabs on in the coming weeks as we've been off to a very slow start to the snow season this year. Back in 1980 mild, wet weather greeted the Stateline for the first part of December. 1.10" of rain fell on this date, for a four-day total of 1.89". The daily rainfall total on the 7th was a daily record, and the third consecutive day with measurable precipitation. Fast forward 31 years to this month: We're expecting mild weather to return by Sunday and Monday, but little in the way of precipitation. Other than a few flurries tomorrow night and a few flurries/sprinkles Monday night, the next seven days look dry. We haven't had a chance to get any real good snowfall under our belt and we may have to wait just a little longer now. The next system coming in Thursday night is 'clipper' like, but it really doesn't have any surface features with it; meaning no surface low pressure. The majority of the forcing coming with this next snow will be from the upper levels of the atmosphere as a shortwave, or upper level disturbance, moves out of Alaska. Sometimes these upper level lows can be notorious for producing several inches of snow and it appears as though accumulating snow will be found from Nebraska through Iowa, Illinois, Indiana and into Michigan. While it's possible we could get a dusting of snow around the area, a quick one to maybe two inches of fluffy snow could fall south of I-88 after dark Thursday and into Friday morning. Looks like our southern most counties; Lee, Ogle and DeKalb have the best chance of seeing anything accumulate.